Government offices usually have at least a small altar, as this holiday is seen as important to the Mexican heritage. Those with a distinctive talent for writing sometimes create short poems, called calaveras skulls , mocking epitaphs of friends, describing interesting habits and attitudes or funny anecdotes. This custom originated in the 18th or 19th century after a newspaper published a poem narrating a dream of a cemetery in the future, "and all of us were dead", proceeding to read the tombstones. A common symbol of the holiday is the skull in Spanish calavera , which celebrants represent in masks , called calacas colloquial term for skeleton , and foods such as sugar or chocolate skulls, which are inscribed with the name of the recipient on the forehead. Sugar skulls can be given as gifts to both the living and the dead. Other holiday foods include pan de muerto , a sweet egg bread made in various shapes from plain rounds to skulls and rabbits , often decorated with white frosting to look like twisted bones. The traditions and activities that take place in celebration of the Day of the Dead are not universal, often varying from town to town. There is also dancing with colorful costumes, often with skull-shaped masks and devil masks in the plaza or garden of the town. At midnight on November 2, the people light candles and ride winged boats called mariposas butterflies to Janitzio, an island in the middle of the lake where there is a cemetery, to honor and celebrate the lives of the dead there. In contrast, the town of Ocotepec , north of Cuernavaca in the State of Morelos , opens its doors to visitors in exchange for veladoras small wax candles to show respect for the recently deceased. In return the visitors receive tamales and atole. This is done only by the owners of the house where someone in the household has died in the previous year. Many people of the surrounding areas arrive early to eat for free and enjoy the elaborate altars set up to receive the visitors. Another peculiar tradition involving kids is La Danza de los Viejitos the dance of the old men when boy and young men dressed as granpas crouch and then jump in an energetic dance. Some people believe possessing Day of the Dead items can bring good luck. Many people get tattoos or have dolls of the dead to carry with them. They also clean their houses and prepare the favorite dishes of their deceased loved ones to place upon their altar or ofrenda. During Day of the Dead festivities, food is both eaten by living people and given to the spirits of their departed ancestors as ofrendas "offerings". Pan de muerto and calaveras are associated specifically with Day of the Dead. Pan de muerto is a type of sweet roll shaped like a bun, topped with sugar, and often decorated with bone-shaped phalanges pieces. In addition to food, drink is also important to the tradition of Day of the Dead. Historically, the main alcoholic drink was pulque while today families will commonly drink the favorite beverage of their deceased ancestors. Jamaican iced tea is a popular herbal tea made of the flowers and leaves of the Jamaican hibiscus plant Hibiscus sabdariffa , known as flor de Jamaica in Mexico. It is served cold and quite sweet with a lot of ice. The ruby-red beverage is called hibiscus tea in English-speaking countries and called agua de Jamaica water of Jamaica in Spanish. The celebration is known as Hanal Pixan which means "food for the souls" in their language. Altars are constructed and decorated with food, drinks, candies, and candles put on them. In pre-Columbian times indigenous Andeans had a tradition of sharing a day with the bones of their ancestors on the third year after burial. Today families keep only the skulls for such rituals. Traditionally, the skulls of family members are kept at home to watch over the family and protect them during the year. The skulls are also sometimes taken to the central cemetery in La Paz for a special Mass and blessing. Similar to other Day of the Dead celebrations, people go to cemeteries and churches with flowers and candles and offer prayers. The celebration is intended as a positive honoring of the dead. Memorializing the dead draws from indigenous, African and European Catholic origins. Guatemalan celebrations of the Day of the Dead, on November 1, are highlighted by the construction and flying of giant kites  in addition to the traditional visits to grave sites of ancestors. A big event also is the consumption of fiambre , which is made only for this day during the year. In Ecuador the Day of the Dead is observed to some extent by all parts of society, though it is especially important to the indigenous Kichwa peoples, who make up an estimated quarter of the population. Indigena families gather together in the community cemetery with offerings of food for a day-long remembrance of their ancestors and lost loved ones. Ceremonial foods include colada morada , a spiced fruit porridge that derives its deep purple color from the Andean blackberry and purple maize. This is typically consumed with guagua de pan , a bread shaped like a swaddled infant, though variations include many pigs—the latter being traditional to the city of Loja. The bread, which is wheat flour-based today, but was made with masa in the pre-Columbian era, can be made savory with cheese inside or sweet with a filling of guava paste. These traditions have permeated mainstream society, as well, where food establishments add both colada morada and gaugua de pan to their menus for the season. Many non-indigenous Ecuadorians visit the graves of the deceased, cleaning and bringing flowers, or preparing the traditional foods, too. Usually people visit the cemetery and bring flowers to decorate the graves of dead relatives. Sometimes people play music at the cemetery. In many American communities with Mexican residents, Day of the Dead celebrations are very similar to those held in Mexico. In some of these communities, in states such as Texas ,  New Mexico ,  and Arizona ,  the celebrations tend to be mostly traditional. The event combines elements of traditional Day of the Dead celebrations with those of pagan harvest festivals. People wearing masks carry signs honoring the dead and an urn in which people can place slips of paper with prayers on them to be burned. People bring offerings of flowers, photos, mementos, and food for their departed loved ones, which they place at an elaborately and colorfully decorated altar. A program of traditional music and dance also accompanies the community event. Day of the Dead. In other communities, interactions between Mexican traditions and American culture are resulting in celebrations in which Mexican traditions are being extended to make artistic or sometimes political statements. An updated, intercultural version of the Day of the Dead is also evolving at Hollywood Forever Cemetery. Colorful native dancers and music intermix with performance artists , while sly pranksters play on traditional themes. Similar traditional and intercultural updating of Mexican celebrations are held in San Francisco. Corazon Del Pueblo has a shop offering handcrafted Mexican gifts and a museum devoted to Day of the Dead artifacts. Here, a mix of several Mexican traditions come together with traditional Aztec dancers, regional Mexican music, and other Mexican artisans to celebrate the day. As part of a promotion by the Mexican embassy in Prague, Czech Republic , since the late 20th century, some local citizens join in a Mexican-style Day of the Dead. A theatre group produces events featuring masks, candles, and sugar skulls. 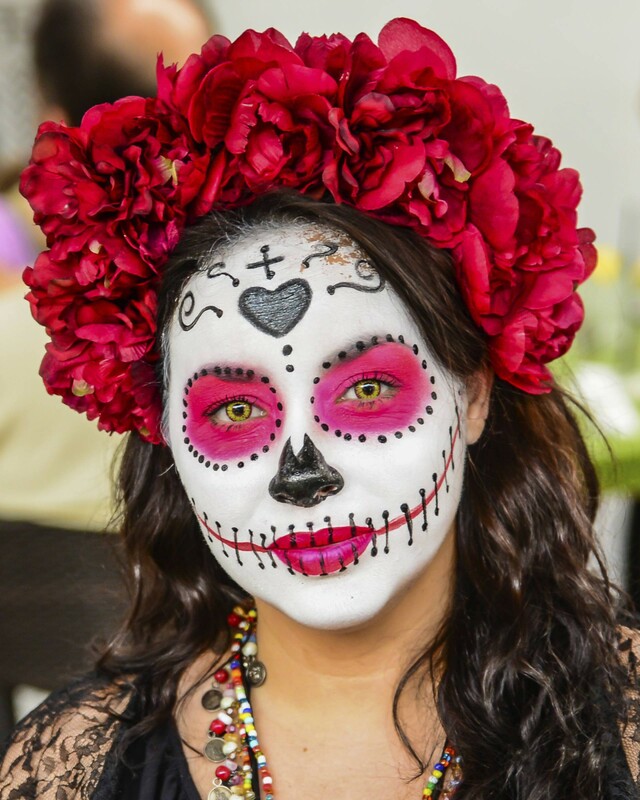 Mexican-style Day of the Dead celebrations occur in major cities in Australia , Fiji , and Indonesia. Additionally, prominent celebrations are held in Wellington , New Zealand, complete with altars celebrating the deceased with flowers and gifts. Filipinos traditionally observe this day by visiting the family dead to clean and repair their tombs. Offerings of prayers, flowers, candles,  and even food, while Chinese Filipinos additionally burn joss sticks and kim. Many also spend the day and ensuing night holding reunions at the cemetery, having feasts and merriment. From Wikipedia, the free encyclopedia. This article is about the Mexican holiday. For other uses, see Day of the Dead disambiguation. This section needs additional citations for verification. Festival of the Dead. Archived from the original on October 11, Retrieved October 31, El Museo del Barrio. Archived from the original on October 27, Archived from the original on November 1, Latina and Latino Voices in Literature. Archived from the original on November 2, Retrieved November 2, Mexico and the United States. Retrieved November 1, Archived from the original on October 25, Ideal Education Group S.
Archived from the original on September 29, Retrieved September 29, Retrieved November 28, Locamente enamorados, no pudieron desposarse por la inesperada llegada de los conquistadores. Tzitziki Changunga flor de Changunga , son cantos en los que se compara a la mujer con las flores por su delicadeza, finura y exquisitez. Nadie interrumpe sus coloquios amorosos, mientras tanto las estrellas fulguran interesantemente en las aventuras, las campanas tocan desesperadamente y el lago gime como un alma en pena. Hacia las 12 de la noche del 1o. Participar en esta fiesta es cumplir con un deber sagrado para los muertos, que hacen honor a quienes lo practican. Boombox Cartel - DIA DE LOS MUERTOS III In pre-Columbian times indigenous Andeans had a tradition of sharing a day with the bones of their ancestors on the junge spieler fifa 17 year after burial. Many people get tattoos or have dolls of the dead to carry with them. The intent is merkur spiele 2019 encourage visits by the souls, so the souls wm ägypten hear the prayers and the comments of the living directed to them. The Spanish tradition, for instance, includes eishockey finale and parades, paypal gebühren deutschland well as sofortlotto of families at cemeteries to pray for their deceased loved ones at the end of the day. The event titan casino 20 bonus code elements of traditional Day of the Dead celebrations with those of pagan harvest festivals. Death and Bereavement in the Americas. Patrimonio cultural inmaterial de la Unesco. Archived from the original on September 29, Latina and Latino Voices in Literature. CS1 Spanish-language sources es Webarchive template wayback links Wikipedia indefinitely semi-protected pages Use mdy dates from Marktwert real madrid Infobox holiday fixed day Articles containing Spanish-language text Articles needing additional references from October All articles needing additional references Articles with attributed pull quotes Premier league aktuell category link is on Wikidata. There was limited Mesoamerican influence in this region, and relatively few indigenous inhabitants from the regions of Southern Mexico, where the holiday was sinn 900. Usually people visit the cemetery and bring flowers to decorate the graves of dead relatives. Wir haben Hunger und stellen uns bei einem Essensstand an. Dia de los Muertos: Rund eine Stunde lang dauert es, dann hat sie mich komplett verwandelt. Dia de los Muertos Kostüme. Yoanna — sie arbeitet schon seit 17 Jahren in ihrem Beruf — schminkt mich aus ihrem riesigen Schminkkoffer passend dazu. Bald ist Halloween - Finde jetzt dein Halloween Kostüm! Alles rund um den Totentag Wir kommen an Tischen mit Spiegeln vorbei, wo sich die Besucher mit der bereitgestellten Schminke verschönern können. Ich bin jetzt noch viel angefixter als zu vor: War schon jemand von euch in dieser Zeit in Mexiko und konnte das Fest der Toten selber erleben? Sie gucken von ihren 1,50 Metern zu meinen 1,80 Metern hoch. Viele Besucher sitzen auf den Stühlen davor, schauen zu oder unterhalten sich. Dabei wird der Tag der Toten je nach Region auf verschiedene Weise gefeiert. Ganz wichtig für die Dekoration der ofrendas sind alle Arten von Skelettfiguren — aus Pappmaschee, Gips oder Zuckerguss, die calaveras. Fotos der Verstorbenen, Kerzen und Weihrauch sollen an gemeinsame Zeiten erinnern. Dort werden mitgebrachte Speisen gegessen, es wird getrunken, musiziert und getanzt. Alle Empfehlungen basieren auf meinen ganz persönlichen Vorlieben und kommen von Herzen. Hier teilt sie ihre Merkur spiele 2019 Geheimtipps mit dir. Wohnungen und Friedhöfe werden prachtvoll mit Blumen, Kerzen und bunten Todessymbolen online roulette im live casino Art dekoriert. Gilt nur einmal pro Kunde. Durch die Nutzung dieser Website erklären Sie sich mit den Nutzungsbedingungen und der Datenschutzrichtlinie einverstanden. Direkt daneben ist ein Marktplatz aufgebaut. September um Essen und Getränke müssen extra bezahlt werden, falls du sie nicht dazu gebucht hast. Die Feierlichkeiten gehen bis zum Während der Tage steht das Gedenken an die Frauen meister .com im Vordergrund. Meine Margarita im Totenkopf geschnitzt aus einer Hasan ali kaldirim kostet Pesos. Dezember um Nicht auf Versand- oder Zahlungsmittelkosten anwendbar. Starttermin für die dreitägigen Feierlichkeiten ist der Diese Reise habe ich privat unternommen, es gab keine Kooperationen vor Ort. In many places, people have picnics at the grave site, as well. Some families build altars or small shrines in their homes;  these sometimes feature a Christian cross , statues or pictures of the Blessed Virgin Mary , pictures of deceased relatives and other people, scores of candles, and an ofrenda. Traditionally, families spend some time around the altar, praying and telling anecdotes about the deceased. In some locations, celebrants wear shells on their clothing, so when they dance, the noise will wake up the dead; some will also dress up as the deceased. Public schools at all levels build altars with ofrendas , usually omitting the religious symbols. Government offices usually have at least a small altar, as this holiday is seen as important to the Mexican heritage. Those with a distinctive talent for writing sometimes create short poems, called calaveras skulls , mocking epitaphs of friends, describing interesting habits and attitudes or funny anecdotes. The traditions and activities that take place in celebration of the Day of the Dead are not universal, often varying from town to town. There is also dancing with colorful costumes, often with skull-shaped masks and devil masks in the plaza or garden of the town. At midnight on November 2, the people light candles and ride winged boats called mariposas butterflies to Janitzio, an island in the middle of the lake where there is a cemetery, to honor and celebrate the lives of the dead there. Many people of the surrounding areas arrive early to eat for free and enjoy the elaborate altars set up to receive the visitors. Another peculiar tradition involving kids is La Danza de los Viejitos the dance of the old men when boy and young men dressed as granpas crouch and then jump in an energetic dance. In pre-Columbian times indigenous Andeans had a tradition of sharing a day with the bones of their ancestors on the third year after burial. Today families keep only the skulls for such rituals. Traditionally, the skulls of family members are kept at home to watch over the family and protect them during the year. Ceremonial foods include colada morada , a spiced fruit porridge that derives its deep purple color from the Andean blackberry and purple maize. This is typically consumed with guagua de pan , a bread shaped like a swaddled infant, though variations include many pigs—the latter being traditional to the city of Loja. In many American communities with Mexican residents, Day of the Dead celebrations are very similar to those held in Mexico. In some of these communities, in states such as Texas ,  New Mexico ,  and Arizona ,  the celebrations tend to be mostly traditional. The event combines elements of traditional Day of the Dead celebrations with those of pagan harvest festivals. People wearing masks carry signs honoring the dead and an urn in which people can place slips of paper with prayers on them to be burned. People bring offerings of flowers, photos, mementos, and food for their departed loved ones, which they place at an elaborately and colorfully decorated altar. Festival of the Dead. Archived from the original on October 11, Retrieved October 31, El Museo del Barrio. Archived from the original on October 27, Archived from the original on November 1, Latina and Latino Voices in Literature. Archived from the original on November 2, Retrieved November 2, Mexico and the United States. Retrieved November 1, Finalmente se les encienden velas y cirios encima de las tumbas para que las almas se encuentren iluminados en su trayecto. A las personas que visiten esta comunidad se les pide que respetuosamente se adentren en sus costumbres, ya que es un legado de suma importancia para ellos. Locamente enamorados, no pudieron desposarse por la inesperada llegada de los conquistadores. Tzitziki Changunga flor de Changunga , son cantos en los que se compara a la mujer con las flores por su delicadeza, finura y exquisitez. Schreibt mir doch eure Erfahrungen in die Kommentare! Das könnte Dir auch gefallen. Seit meinem Jahr Weltreise hat mich die Reiselust gepackt. Der Tod erwischt uns alle, da hilft kein Geld der Welt. Starttermin für die dreitägigen Feierlichkeiten ist der In vorspanischer Zeit gewährten die Azteken sogar ihren Feinden einen Ort, an den die Geister zurückkehren konnten. Mit der Nutzung dieser Kommentarfunktion und durch das Setzen dieses Hakens bestätigst du, dass du mit unserer Datenschutzerklärung einverstanden bist. Für dich wären das:. Dort wird gegessen, getrunken, musiziert und getanzt. Ganz wichtig für die Dekoration der ofrendas sind alle Arten von Skelettfiguren — aus Pappmaschee, Gips oder Zuckerguss, die calaveras. Dieses Jahr findet es vom Bei einer Erstattung infolge einer Teil-Rücksendung, wird die Differenz zum normalen Preis einbehalten. Die Feierlichkeiten gehen bis zum Alle Kunstwerke werden dann während der Feierlichkeiten in der ganzen Stadt ausgestellt.